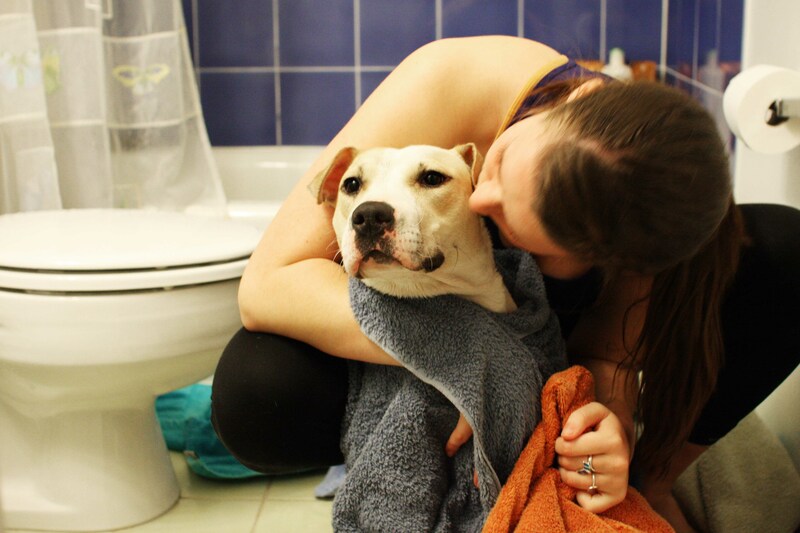 There are a couple things you really have to do with a dog you spring from a shelter, and giving them a bath is on the top of that list for us at PLF. To her dismay, Johnnie was no exception. Mark decided he wanted to try and make it her decision to get in the tub (unlike the fate of many others who simply get picked up and plopped in). We tried for about ten minutes using one of her favorite antlers, to no avail. So she was plopped in as well. She surrendered to the suds almost immediately after we got her in there. 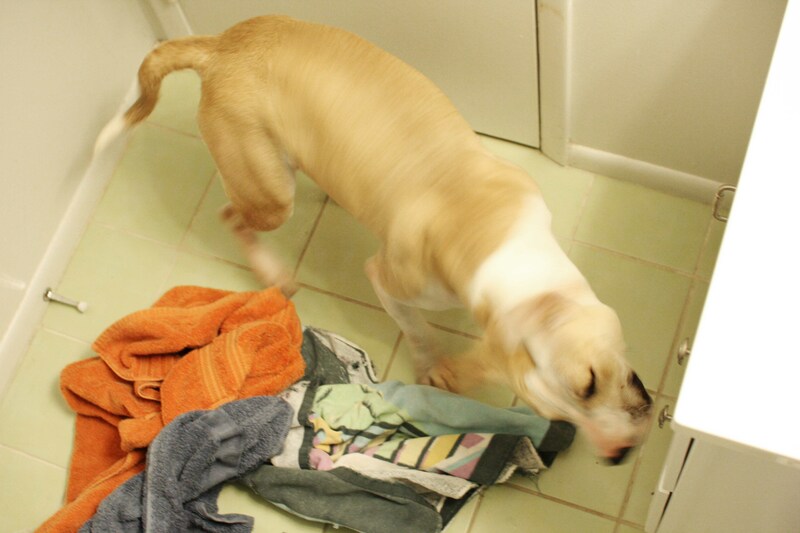 But, like most of our foster pups, Johnnie Cash reaped the reward of a good shake off and towel dry down afterwards. She pretended like she didn’t like that part either, but I know she was soaking up the attention. All in all she was a model pup for her first bath time! If you’d like to add a fresh and clean Johnnie Cash to your family, email peacelovefoster@gmail.com. This entry was posted in Dog talk, Johnnie Cash, Rescue/Humane Society and tagged adoptable, adorable dog in bath, bath time, clean dog, dog in bath, first bath, foster dad, new foster, tan and white pit bull. Bookmark the permalink. Johnie is so adorable! I used a peanut butter kong to entice my lab into the tub. After a few times with that, he has jumped in on his own ever since. It is quite be back saver haha! He’s adorable. You can tell he loves the snuggles at the end of bathtime! ahahaha that face in the 3rd pic. so eeyore. What a doll baby! Moby is heading for the dreaded bath this weekend. He is in denial about it though. Mine hate the bath! We were lucky with our newest addition: on the day we brought her home her morning consisted of breakfast, bath, then spay. She still hasn’t had a bath here in her new home! Great photos – especially love the last one. JC is in good hands! He looks sooooo much like Teeny, my previous foster dog. He’s a keeper!